LBJ was a monster and a tyrant who exploded the size of government and was responsible for far, far more deaths than H. W. That said, there isn’t much else I disagree with here except I’d add “Pappy’s” close ties to the Saudis as perhaps my biggest reason to hate him. And his involvement in Iran-Contra. When I read Ben Bradlee Jr’s Guts and Glory in high school, one of the things that struck me then and sticks with me today was that so many in the Reagan administration at first did not accept Bush Sr., but that they were won over eventually and so impressed that he was the kind of guy who could know a secret and “act out of the loop.” That’s it. That’s what he was known and respected for. Not competence or politeness. Keeping secrets and acting a fool. And I do think one of the best points Ted makes on foreign policy is the effect treating opposing heads of state poorly has on our future dealings. LBJ may not have pulled the trigger, but he was an integral part of the conspiracy to wack Kennedy. Also, LBJ had allies in the CIA who saw Kennedy as an existential threat to the agency. Meanwhile, the AshkeNAZI crime family (you know them as the joose) likely assisted in the conspiracy. He was the 2nd president of 4 to support the economic engine of destruction known as Alan Greenspan. First, one must expect the worst things that any CIA chief has done, are intended, by nature of the institution, to remain generally unknown. Yet, however short Pappy’s tenure at the CIA (30 Jan 1976 – 20 Jan 1977-Carter inauguration) it had far reaching effects for him and the country. 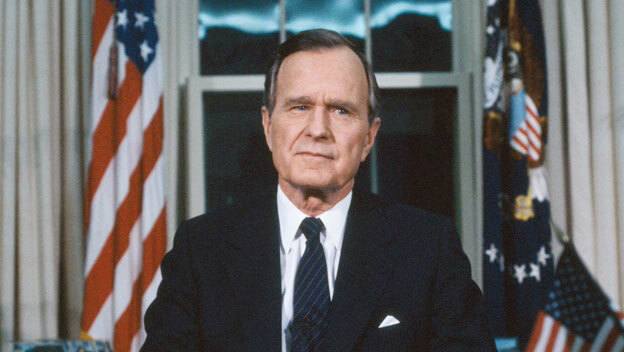 All should read the book “Killing Detente: the right attacks the CIA” by Anne Hessing Cahn to get a look at the CIA tenure of the eminently execrable Pappy Bush. Her book describes the standardization, if not the creation, of the process of “reassessment” of intelligence findings for political purposes. This project was initially assigned by Gerald Ford to then CIA chief Colby who refused to do it. Pappy was determined to be depraved enough for the task and was appointed new CIA chief. In this instance, the so-called “Team B” was assembled to overturned the prior CIA assessment that held the Soviet Union was essentially crumbling and, therefore, no real threat to the US. Reagan used the new, false fear mongering of the “reassessed” intelligence, to wildly increase war spending (tripling the national debt in the process) while knowing that ultimately he could take credit for conquering the “evil empire.” I’d suggest that Pappy Bush was given his VP post as reward for his Team B efforts. Kennedy was GHW Bush’s first conspiracy involvement in assassinating a sitting American President … it was his second attempt to assassinate a President that he failed. I agree, he started a lot of wars. Hilary is more mediocre and benign. I would argue that he started the modern version of war we now have where TV is used to get the public on board. He sucessfully broke the usefulness of the media that had (somewhat) turned the public against the Vietnam quagmire. He figured out how to manage the media. Reagan managed the media but was a much more genuinely public personality. Bush figured out how to hide a war and make it seem to be a genuine humanitarian human rights crusade until about 5 years after when finally it becomes too obvious that imperial war is not about human rights. But since Panama and later Kuwait, we’ve had very ‘popular’ wars. Boy, do these diskush’ins go way off track, eh? Now let’s take a look around the world at other places where creeps like this finally die. In many parts of the world, people celebrate. It’s part of showing that people are happy to say good riddance to bad rubbish, and also, what better way to show Dubya, Cheney and his ilk what people think of them and what lies in wait for them when they shuffle off this mortal coil! Now, I know that ain’t PC, but PC is used too much for hiding real feelings, intentions, and whitewashing the truth. > Boy, do these diskush’ins go way off track, eh? As an example, the article didn’t say anything about PC-ness, Dubya, or celebrations. But that doesn’t mean I didn’t appreciate your comment. d’Oh! Two seconds after I hit ‘post’ I noticed that the article did, indeed, mention dubya peripherally. Coddle dictators like Marcos and sweep the bones of their victims under the rug. Are you really going to excuse a third-world dictator’s death-squads and still froth over Dubya walking away from his shady dealings? Is this some sort of low-expectations bigotry – yeah he’s a murdering, embezzling thug but he’s brown and can’t help himself so let him walk – or are you feeling more leftist self-loathing than usual? Might I suggest a course in reading comprehension? Or are you seriously proposing that it’s preferable to kill thousands of innocents in order to get one bad guy? Look how well that worked out with Hussein; Bush #2 killed far more Iraqis than Saddam ever did. He murdered hundreds of thousands of Afghans while *not* getting UBL. In case you hadn’t noticed – those actions set the stage for ISIS today. You’ve got a better opinion of ol’ #41 than I do, Ted. I lay the Iraq war solely at his feet – his flunky did give Saddam a green light to invade, just as you say. But I sincerely doubt she (?) did so without Bush’s tacit consent, and even if so there was plenty of time to step in before Saddam actually crossed the border. Bush’s polls were slumping, what better way to bolster them than with a war? What are a few measly war crimes in comparison to reminding the Muddle East who the boss is? He’d been Saddam’s good buddy for years, defended him to the UN, sold him the helicopters and chemicals used to gas the Kurds and then stabbed him in the back. No wonder Saddam tried to have him killed.